As anyone not living in deep denial now knows, the near future holds tremendous challenges for civilization as cheap and plentiful sources of energy, water, and land begin to disappear. We are faced with the huge challenge of transforming our high-consumption lifestyles in a relatively brief span of time if we are to avert run-away, catastrophic climate change. Faced with these odds and the apparent gridlock of liberal democratic regimes in the U.S. and E.U., it’s easy to give in to dark currents of despair, apathy, and cynicism. Faced with the apparent inability of the political system to catalyze change, it’s a huge shot in the arm to see specific examples of sustainable living being created today. There are lots of low-tech ways to achieve sustainable living. A good guide to such methods is Scott Kellogg and Stacey Pettigrew’s Toolbox for Sustainable Urban Living, which discusses everything from composting and keeping urban chickens to reclaiming land and generating energy. Kellogg and Pettigrew’s approach is incredibly important because it’s low tech, and consequently is relatively accessible to ordinary people. Every now and then, however, it’s useful to speculate about how advanced technology might render life more sustainable. 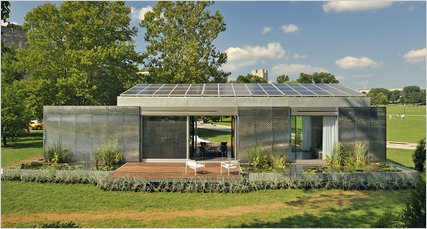 In this regard, the Lumenhaus, which just won the 2010 Solar Decathlon Europe, is quite inspiring. As this film shows, the Lumenhaus incorporates many cutting-edge elements of sustainable design into an extremely elegant and simple form. The house features solar panels linked to a smart grid, meaning that the house can generate its own electricity and even feed excess power back into the grid. The house also features stainless steel screens and insulated windows that ensure that the house is cool in the hottest summer and warm in the coldest winter. In addition, water is purified and recycled through landscaped filtration systems. And the entire house is wired and smart, making it possible for householders to get real-time updates on conditions in the house and easily change those conditions at will. People with enough money to afford this sort of house – and there obviously are far fewer after the crash of the housing market in the U.S. – should be building themselves something along these lines rather than the ridiculous McMansions that have been popping up in suburbs around the land like malign mushrooms. The problem I have with this otherwise inspiring design is that it’s both literally and metaphorically set in the middle of nowhere. The design seems to assume that only the house needs to be changed, rather than the entire fossil fuel-based mode of living in the U.S. After all, how will people get to this house? In today’s gas-guzzling jalopies or in solar-powered electric cars? Even if we get a viable infrastructure for electric cars in the next couple of decades, where will the highways come from? Where will the food come from? Who will control the land where that food is grown? What this laudable design underlines, in other words, is the need to transform our entire civilization. We need to be living in far more compact cities rather than in the sprawling suburban- and exurban megalopolises of today. We need public transportation and sustainable agriculture. And we need a far less inegalitarian society. Unfortunately, the only way we’re really going to get these things is through significant political change. Design alone will never solve our problems, although such concrete action inspires hope in an otherwise bleak moment.